In a Hollywood world flooded with post-Walking Dead zombies, writer Yolanda Ramke attempts something different with the co-direction of Ben Howling. Cargo is a different take on surviving in zombieland that’s more than guns to the head of the undead. 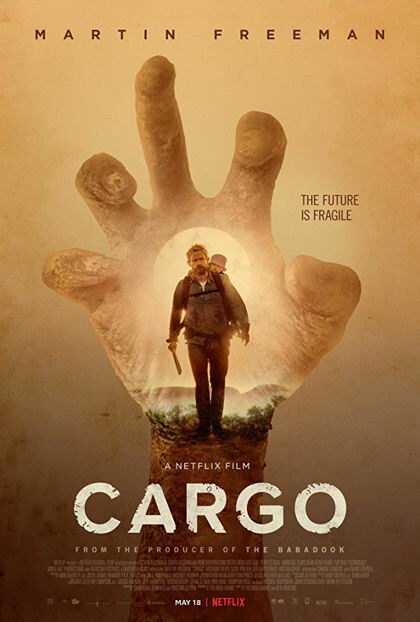 Cargo captures the paternal need to care for your child in the performance of Martin Freeman. Freeman’s portrayal doesn’t attempt to win an Oscar, simply keeping his character grounded in a realistic performance. An excellent opening and even better ending are combined together with what feels like the less important episodes of The Walking Dead about side characters that most people complain about but I always tend to enjoy more. It’s a journey through the undead focusing on love and family with less of the backstabbing actions that too often tend to be the focus of both zombie cinema and post-apocalyptic blockbusters. This short film adapted feature is ‘The Road’ of zombie films. It may not hold the pace, brutality or body count people have become accustom to but does give what I find most important, a simple yet enthralling story that keeps the viewer captivated.